Picasso guided tours take place on Tuesdays, Thursdays and Saturdays. Tours are usually available after mid-morning (10 am) and at mid-afternoon (around 3 pm), but it rather depends on the provider you choose. In general, any time of the day is OK for taking the tour. We are comparing Picasso Walking Tour & Picasso Museum of Barcelona Prices from leading ticket suppliers and Try to find you Cheap tickets prices on the market. An overview of Pablo Picasso's early life before he moved from Barcelona to Paris, the capital of art at the turn of the 20th century. A survey of places the famous 20th-century artist visited while living in the capital of Catalonia and of his artistic development. The introduction of the techniques the great artist used in creating art pieces during his early life. A guided tour of the Museum Picasso, which houses the largest collection of Pablo's works of art originated during his life in Barcelona. Taking the tour is among the top things to do for devotees of the 20th-century art and for those wishing to learn the place of Barcelona in the world of art. Taking the tour is highly recommended to admirers of Pablo Picasso. People interested in art movements such as Cubism, Surrealism and Symbolism should enjoy the guided tour in particular. Your Experience With Picasso Walking Tour & Picasso Museum of Barcelona? Walk the streets of Barcelona in search of places closely relating to Pablo Picasso's youth. Learn what art school he used to be a member of and what cafe he liked to spend his leisure time at. Tour the La Ribera neighborhood, where Pablo founded a studio where he used to work. Avoid waiting in lines to enter the Picasso Museum and benefit of the guided tour inside. Examine the large collection of works of art created by the artist. What Picasso Walking Tour & Picasso Museum of Barcelona Includes? The guided tour of the bohemian Barcelona introducing places related to Picasso's early life. Priority entry to the Museum of Picasso. The assistance of the professional guide and the guided tour of the museum devoted to Picasso's artistic work. The Els Quatre Gats café, the Architects’ Association building, the Llotja Mar art school, La Ribera and the Picasso Museum. The works of art at the Museum Picasso follow the chronological order, allowing you to perceive the course of the master's artistic development. Picasso moved from Malaga, where he was born, to Barcelona at the age of 14. Some paintings you shouldn't miss during your visit to the museum are "Science and charity," "The mad" and the "Las Meninas" series, relating to the famous painting of Diego Velazquez. Travelers Reviews about Picasso Walking Tour & Picasso Museum of Barcelona? Some participants in the tour underline the wide knowledge of the guide about the life of Pablo Picasso and Barcelona in general. A lot of travelers recommend their tour guides for a high level of service they provided. Their comments hint that they had a much better understanding of the artist's work and life and the city itself after the tour. 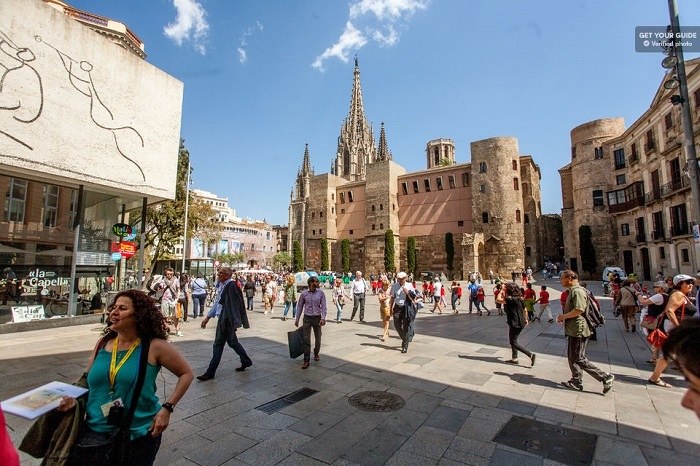 The number of satisfied travelers and the overall rate they gave to the guided tour make joining it one of the top activities to do in the Catalan capital. The guided tour isn't suitable for people suffering from reduced mobility. You may present either printed or electronic voucher to join the Picasso walking tour. A full refund is typically granted for cancellations up to 24 hours prior to the scheduled tour, but do check it out with the provider of your choice nevertheless. Since the guided tour involves a lot of walking, put on comfortable shoes. Make sure to arrive at the designated spot before the beginning of the tour. Central Barcelona - Tourist information center (please confirm because the departure point may differ depending on certain factors).